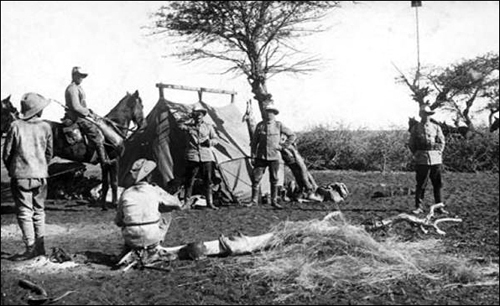 German soldiers encamped in Southwest Africa at the turn of the 20th century. These words of Heinrich Goring, the father of Hitler's "Reichsmarschall" Hermann Goring, mark the initiation of the bloodiest period in German-African history. During the colonial push of Great Britain and France, the German public, encouraged by the conservative media of the time, called for colonial engagement. In the 1890s, Southwest Africa was marked as Germany's own imperial "run for Africa" which was in line with Social Darwinism. Many were arguing for the "civilizing role of imperialism." The major tribe living in Southwest Africa -- the Hereros -- were quickly defeated by German troops dispatched by Emperor Wilhelm II. Berlin immediately began to take the natives' land and sell it to German farmers. Hereros and Namas were abused as slaves, their societies were crushed, poverty and despair took hold, and the weak and the handicapped were left to die. 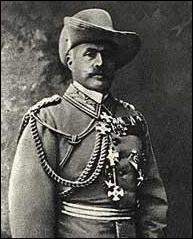 "The great general of the German troops, sends this letter to the Herero people. Hereros are no longer German subjects ... All the Hereros must leave the land. If the people do not want this, then I will force them to do it with great guns. Any Herero found within the German borders with or without a gun, with or without cattle, will be shot. I shall no longer receive any women or children; I will drive them back to their people -- otherwise I shall order shots to be fired at them ... No male prisoners will be taken. I will shoot them. This is my decision for the Herero people," wrote the German military commander of Southwest Africa Lothar von Trotha (1848-1920). "I know enough tribes in Africa. What they have in common is that they all just yield to violence. To exercise this violence with terror, and even with cruelty, was and is my policy," he once said. On January 12, 1904, the Hereros began an uprising against the occupation in the city of Okahandja, a German military operation base. Railways near the city of Osona were blown up in order to stop the reinforcement for German troops. The Hereros fought the occupation for four years, but the German counterstrike decimated at least 80 percent of their population. 65,000 Hereros died in combat or concentration camps. In the view of many experts on world history, Germany's war against the Hereros stands for the beginning of genocide as a part of geopolitical strategy. For the first time in German history, concentration camps were established, inspired by the "invention" of such camps by England in its own Boer War in 1900. During detainment, at least half of the prisoners were executed by hanging or firing squad, starved or died of infectious diseases. On August 11 to 12, 1904, the counterstrike against the Hereros' uprising became a war of extermination. Thousands of fighting Hereros were killed in a bloody battle by German artillery cannons and machine-gun fire. The survivors, surrounded by German troops, were left to die of hunger and thirst. Southwest Africa later became a colony of the Republic of South Africa and gained independence in 1990. It is now the nation of Namibia. Hereros at the hands of their German captors. To ordinary Germans, the genocide of 1904-1908 is largely unknown. I wouldn't have been able to write this article without the engagement of my old history teacher in school, a man with a wide range of knowledge. The focus of history teachers in Germany is concentrated mostly on World War 2. 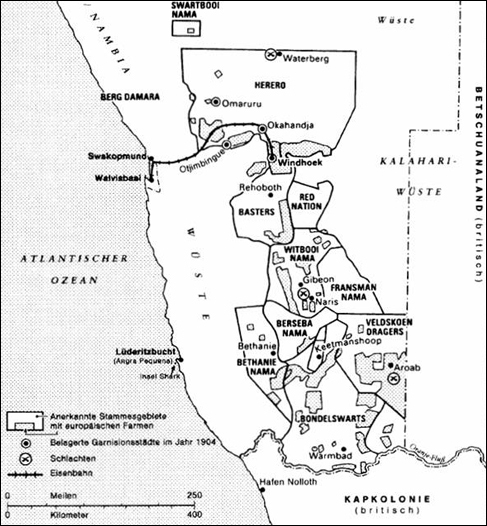 So most German history teachers don't tell their pupils about war crimes in Southwest Africa. Often they don't even know anything about the genocide themselves. Naturally Germany's political class, the media and the public do not remember the crimes committed in Africa 100 years ago. In 1995, former Federal Chancellor Helmut Kohl refused a meeting with Herero officials while making a state visit to Namibia. 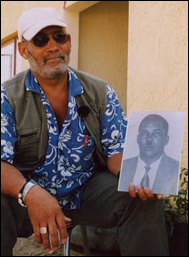 Roman Herzog, Germany's president from 1994 to 1999, also refused to issue an official apology for the Herero genocide during a state visit in 1998. While visiting Namibia four weeks ago, German Foreign Minister Joschka Fischer also avoided a gesture of reconciliation and confession of guilt. Federal Chancellor Gerhard Schroder doesn't seem to have realized the problem yet. There is only one famous book describing the horror of the Herero genocide: Gerhard Seyfried's "Herero" (2001), by the publishing house "Eichborn." No official commemoration ceremonies, no apologies, no regrets -- no memory. 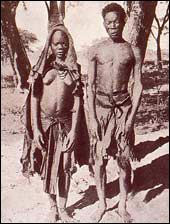 100 years after German troops killed, raped and humiliated Southwest Africa's natives, there seems to be no interest within German society to remember and regret its first genocide. The mass murder was not even recognized by the German Parliament as what it was -- a genocide. There are no memorials for the brave Hereros, neither in Germany's capital city of Berlin, nor in any other German city. Only some diligent German magazines publish articles retelling the story of Germany's first steps towards "nation building" which later imploded into one of the most horrifying war crimes in history. Since 1990, Herero representatives have struggled for an official German apology and for financial compensation. 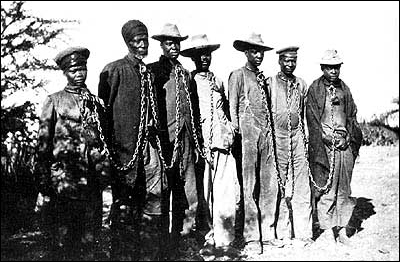 In September 2001, the "Herero People's Reparation Corporation" submitted a claim for compensation in a U.S. court totaling US$2 billion against the Federal Republic of Germany, Deutsche Bank and several other companies which profited from slavery and the war in Southwest Africa. Experts on German law are sure there is at least a good chance for a financial compensation package to be approved for the 30,000 living descendants of children of African women who were raped by German soldiers during the occupation. Alexander Krabbe is a German medical student at Ernst-Moritz-Arndt University of Greifswald, Pomerania.